Asking what one should wear to a craft fair is sort of like asking “what should I wear to work?” The answer would depend greatly on the type of work, the environment and who you interact with in a day. There isn’t a straightforward answer to “what do people wear to craft fairs?” because it depends on the business you’re representing, the event you’re selling at and the shopper you’re wanting to attract. Someone selling high-end art at an art show would want to dress up while someone selling vegetables at a farmers’ market might want to dress down. A vendor at a craft show selling vintage inspired children’s toys would want to have a much different look than someone selling trendy jewelry. 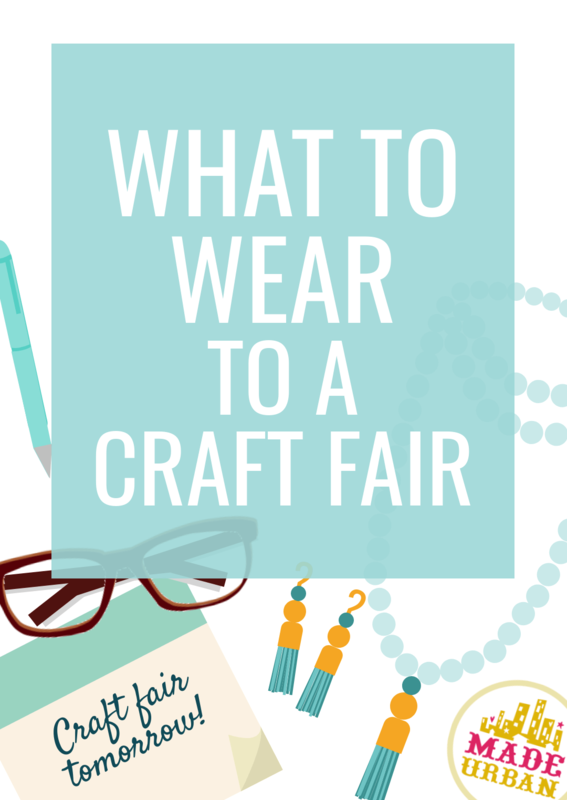 Check out the four factors to consider when deciding what to wear to a craft fair on. Research shows that how you dress influences how people perceive your trustworthiness and intelligence; important factors when deciding who to give our money to. If your signage and sales pitches say your products are trendy and high quality but your look says “I don’t follow trends or pay attention to details”, it creates conflicting messages and the shopper isn’t sure whether to trust your written and spoken word or your actions. Putting thought into what you wear and how you look also influences how you act at a craft fair. Choosing your outfit with care can boost your confidence. I know when I’ve had to rush out the door and haven’t had time to thoughtfully choose my outfit or do my hair or makeup, I don’t feel confident. When I don’t feel good about the way I look, I don’t want to draw attention to myself. I can’t fully concentrate on what I’m saying because I’m wondering if the other person is noticing the cat hair all over my sweater or my messy hair, and I can’t wait for the day to be over. That type of attitude and those types of thoughts at a craft fair did not help me be the best salesperson, brand representative or bring my best sales. Birds of a feather flock together so you want to first and foremost, dress for your audience. Not to mention, unfortunately in this society, people do make initial judgments based on appearances. Think about when you’ve been out in public, among many people, and someone catches your eye. When someone is dressed and styled in a way that appeals to your sense of style, you can’t help but notice them. At a craft fair, you want to be dressed and styled in a way that appeals to your ideal customer’s sense of style. This way, if your display doesn’t do its job and catch their attention with a standout display trick, at least you will. First, think about who’s attention you want to grab at a craft show and how they might dress or expect someone they’re conducting business with to dress. Then consider what you want shoppers to immediately get about you. It may be that you’re down to earth and a free spirit or that you’re a professional and pay close attention to details in everything you do; from applying red lipstick that perfectly matches your nail color to ironing your shirt. Before you start planning what you’ll wear to a craft fair, you should have an amazing display planned. If you need help in that area, sign up for my FREE 5 day email course: 5 DAYS TO A STANDOUT DISPLAY. 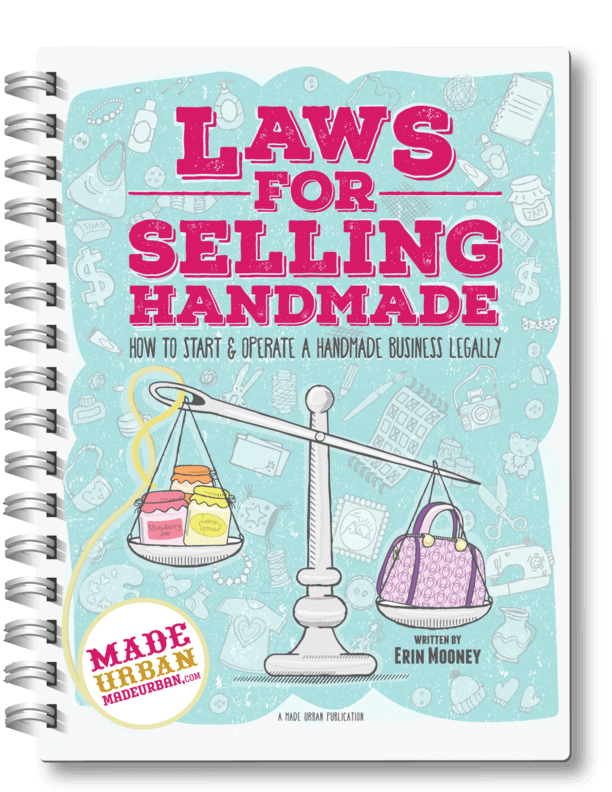 It will walk you through the simple steps required to create a killer craft fair display that draws shoppers in and converts them into customers. Read more about it and sign up here. Part of deciding what to wear to a craft fair should be based on that amazing display. There should be an obvious style to your display and what you wear should fit with that style. If your display has a very light, airy and feminine feel to it, you wouldn’t want to show up in all black and dark shades of makeup. It would be more fitting to wear all white or soft pastels and have a light, airy and feminine feel to your look too. Determine how you would describe the style of your craft fair display and then what you can wear to fit with that style. A brand is one of the most important aspects of a business because it tells consumers why they should buy from them over a competitor. It’s sort of like how we give off first impressions and let other people know who we are in our personal lives. Hypothetically speaking, if I dress trendy, smile at everyone I interact with, always say “please” and “thank you”, crack little jokes here and there and drive a Prius, I’m telling people, in a roundabout way, that I’m trendy, kind, have a great sense of humor and care about the environment. If I were a business, that would be my brand. I’d be showing people the things that matter most to me: trends, kindness, humor and the environment so they know right away, whether or not we have something in common. I’m showing people how I’m different from all the other blue-eyed, blond-haired girls who dress trendy. Your brand should also tell consumers who you are through your business’ looks, behavior, communications, products, etc. Let them see how you’re different from the other businesses selling handmade jewelry, scarves or soap. First you must know what makes your business different (your USP or unique selling position). If you aren’t sure, join my other free 5-day email course: BEAT LAST YEAR’S SALES. The email sent on Day 3 will help you uncover your USP, which is the foundation your brand should be built on. Once you know your USP and have defined your brand, think about how your brand can be communicated in what you wear. Imagine Pepsi and Coca-Cola both being vendors at a craft fair. Pepsi’s brand being young and hip, and Coca-Cola’s brand being more classic and family focused. Pepsi’s vendor may wear something trendy, young and hip, perhaps incorporating the Pepsi blue and adding a pop of red. Coca-Cola’s vendor may wear something a little more conservative and classic, incorporating red and white. Each would be dressing appropriately to represent their brand. What can you wear to communicate your brand? Not all craft fairs are the same. My favorite ones to visit in my city all have a different feel and attract a different demographic. One is very quirky and laidback while another is a bit more posh, modern and trendy. They each draw a very different crowd of shoppers. Although I might describe my sense of style as a little more trendy, I’m still a shopper at both events. BUT…what I expect from the vendors at each even is very different. What fits in and feels so cool to discover at one event might seem out of place and lose its value a bit at another event because of its surroundings. There are certain things shoppers are expecting and not expecting to see when they stop by a craft show they’ve heard about. Consider the event’s brand, their marketing and what type of shopper they’re likely to attract. Let what you wear be influenced by the craft fair. A more relaxed event may call for a dressed down version of what you typically wear while a more posh event may require you to take your outfit to the next level. Dress in layers, especially if the event is outdoors. You want to stay comfortable and the easiest way to do that is to be able to add or take away a sweater, scarf, blazer, rain jacket, etc. When in doubt; overdress. It’s better to be a little overdressed for the occasion than underdressed. Scent is a powerful marketing tool but be sure to keep your perfumes/colognes subtle. Bring a pocket mirror to check your appearance throughout the day. Unless you brought a helper, you’ll be eating in your workspace, between customers. Check your teeth and face to be sure there’s no food in or on them after eating. That was probably a more complicated answer than you were expecting to find when you searched or wondered “what should I wear to a craft fair”. Of course, you can wear whatever you like to a craft fair but as the saying goes: Dress for the job you want. The Gap, Starbucks or The Body Shop wouldn’t tell their sales people to wear whatever they want when they come to work. They have an image to uphold and so does your business. If you’ve signed up for a craft fair to get out, meet new people and talk about your craft, and selling a few items is a bonus, then by all means, dress in whatever is the most convenient and comfortable. But if you’re trying to build a brand and boost sales, consider the points in this article when deciding what to wear at your next craft fair. I am in my first market hosted by Swords & Sabres this year. It’s a Pirate/Steampunk/Midieval theme…. just contemplating what to wear! It’s also outdoors. My son is coming with me (he’s 10) and is looking forward to dressing up the part too! Will have to see what is in my tickle trunk and go from there! So true! I feel like a acquired an entire costume wardrobe to wear, depending upon what type event I’d be vending at, and all were great investments, business tax-deductible too, might I add! Many of the events I’ve done have been renn faire-ish, some where period-specific dress was *required*. But these outfits also have worked for non-renn-faire events where it played to the history of my craft. Customers seem to love this if you “look the part”, as well as if you busy yourself in your booth doing something related to your craft production: example cutting/trimming/packaging soap. Spinning yarn on a spinning wheel (for fiber crafts) and *looking* the part of the princess spinning straw into gold from Rumplestiltskin. Draws them in like bees to honey! So not only in your clothing, but any “props” you can use to advantage in your booth are all a huge plus! Hi, Have just read the blog think it is great and some usefull things to think about. I trade under the name Ginghamrose here in Norfolk England and I never know what to wear. Amonst the things I make are aprons so i am now thinking of making an apron with two fabrics one gingham and one with roses on it. I will be sharing this blog with my husband although I don’t know what he could wear at the moment he wears a black apron with his logo on he makes miniture rocking horses.